Yoga. Everyone knows what it is, but there are still a lot of misconceptions around it. That isn’t helped much by the fact that it’s become almost fashionable to do yoga these days; some people buy so completely into the 'yoga image' that it seems that the main point of doing yoga is shadowed by its ability to produce lithe bodies and admiration from others. There are certainly worse things that could happen in life, so this isn’t a complaint; it’s just an acknowledgment that those who are new to the idea of yoga may be put off by the prevalence of ‘yoga ego’. It could be quite intimidating for a newbie when faced with a class of perfect-bodied yoginis clad in Sweaty Betty’s finest and ‘omming’ in perfect unison. Don’t let it happen! Not all yoga circles are this way, and not all beautiful yogis are missing the point. There’s also an opposing school of thought that says yoga is boring, or too easy. That usually comes from those who’ve only witnessed a few yogic twists, hatha style. There are many kinds of yoga and some of them will have you limping to work the next day with serious DOMS. The good news about that is that you can take your pick. Select a yoga type to suit your health and fitness requirements, whether that be total body strength, mental relaxation or physical restoration. Yoga is one of the best things you can do for your physical and mental health – there’s no doubt about it. In 2017 yoga is omnipresent! You’re never far from a class, and if you can’t find a class, you can find hundreds online. You can even find it in most local gyms, although it tends to be more based on fitness and there won’t be many of the frills that make the typical yoga environment appealing. If you can’t find a class to suit your schedule, grab yourself a decent yoga mat and allocate a regular slot at home. Download or stream some great videos from YouTube, making sure you choose a teacher who guides you carefully through positioning so that you don’t hurt yourself. Discipline is key – you may well be wobbling around all over the place at first but it doesn’t take so long to become more proficient and your practice will become more natural. You can squeeze in a thirty-minute morning yoga session before work if you’re determined, or fit one into your lunch hour if you’ve got a little bit of private space somewhere at work. Where there’s a will, there’s a way and before long you’ll be going out of your way to make time. The mental benefits of yoga are not exactly a secret either, but they don’t arise from subscribing to a particular set of spiritual beliefs – yoga is meditative in nature because it directs your focus so thoroughly. It is very difficult to think about what you should watch on Netflix later when you’re trying to maintain your Eagle posture, for example. You will find that it takes a lot of concentration to maintain each pose – even the more simple ones – due to the precise positioning required. In this way, you’ll become completely present and grounded in the moment, which is all meditation really is anyway. Then there is the relaxation part of each class toward the end; after that extended period of focus, you’ll lie on your back in ‘sevasana’ pose, and the relaxation vibes in the room are usually palpable. After a good yoga session, your entire mood should shift; anxiety tends to dissipate without effort and the rest of your day will often feel breezy. Anyone can do it. Yes, anyone – children, the elderly, people with disabilities… there is a type of yoga that will work for you. There’s hatha, astanga, vinyasa flow, Jivamukti, Iyengar, Bikram, hot yoga, yin yoga, kundalini yoga, acro yoga, restorative yoga… and more. Some are substantially more vigorous than others, but you can start off with a standard, more gentle yoga like hatha and work your way up to something more challenging like astanga or Bikram. If it’s mental or spiritual benefits you seek, try some yin or kundalini yoga. If you’re looking for something physically demanding and to see some quick fitness results, the latter two (or a vinyasa flow class) would be your best bet. There’s also no reason you can’t learn yoga through one of the more challenging types; it’s all part of the fun. You may find that you love one kind and can’t stand another - that’s normal. There are a lot of variations and techniques, and a lot of different teachers with different attitudes and philosophies. Keep trying classes until you find one you love, and then build on your practice there. Last but most definitely not least, yoga is exceptionally good for your health. This is because the flow of yogic positions and the stretches involved allow for energetic blockages to be released. There can be a lot of tension and tightness in various parts of the body, brought about through things like poor posture, stress, and lack of exercise. Yoga is the antidote to all of these issues. Some of the yoga poses literally squeeze out the tension, massaging inner muscles and internal organs, getting the blood flowing. The breathing aspect of yoga also offers big benefits to your health; the ‘pranayama’ (breathing exercises) that are a part of most yoga styles can flood your body with oxygen, helping you to remain disease free. The movement itself constitutes good exercise, strengthening the body’s structure and immune system at the same time. I wouldn’t mind betting that the more you think about it, the less reasons you can find for not doing yoga! The main thing is to listen to your body and not push it beyond its limitations – what might be impossible right now (and may seem permanently impossible) may actually just be a year or two away, with regular practice. Yoga allows for many goals – it’s an aspirational practice that can be extremely rewarding with dedication. Healthy practices like yoga, when combined with a natural, healthy diet can lead to vitality like you’ve never experienced. You won’t know until you try! 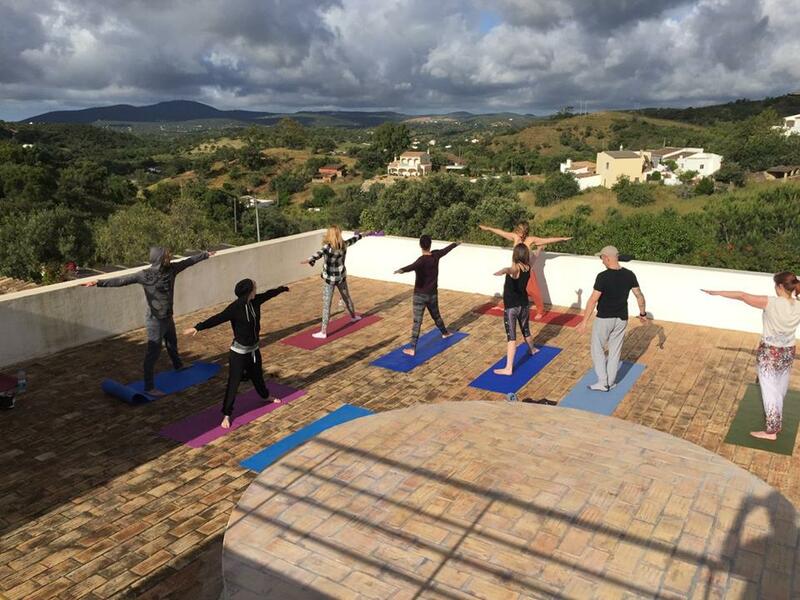 Yoga is an integral part of Magnetic Movement retreats and is always on the schedule. If you're really not a fan though, don't worry. All sessions are optional.